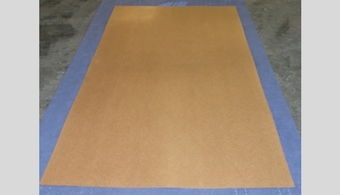 Our Standard Hardboard has one smooth surface and can be used for floor coverings, panelling and for doors. It is easy to cut and fix and can be painted. The standard size you can get this in is 3.2mm x 2440mm x 1220mm, however we can source other grades for you if this is your requirement. This is hardboard that has been coated with a thin film of Linseed Oil and then baked; this gives it more water resistance, impact resistance, hardeness & rigidity.